• Eight individual adjustable feed belts ensure easy setup and smooth feeding. • Designated A/C motor with micro-adjustable variable speed controller for even spacing of box blanks. • Feeder start/stop can be controlled by remote controller at any operation area. • Two standard feeder gates (30mm or 1.18’’ wide). • Two short supporters with wheel and two long supporters sustain the pile of blanks for perfect feeding. • Four adjustable side guides. • Vibration system for smooth and consistent feeding. • Belt cleaning brush with easy angle adjustment for better cleaning of belt surface to increase the feeding stability. • Suction feeding system (Optional). • Three carriers throughout with pre-breaking sword (180°) at the left side and belt pre-break device (135°) on right side enables the pre-fold of the 1st and 3rd crease line to make final filling much easier. • Sectional upper carrier combined with special design can be telescopically adjusted, no need to tension the belts, quick set up and job change over. • UV grinder and vacuum suction system (Optional). • Plasma surface treatment unit (Optional). • Three-carrier construction with split upper carriers. • Easy for mounting lock bottom accessories, more operator friendly. • Sectional upper carrier has the same design function as the one in pre-breaking section, suitable for make special shape boxes. • Data entry keypad with digital display and the back folding system can be operated easily. • One set mechanical (B-TYPE) lower gluing pot (left side) is specially designed not to splash glue during high speed production for easy maintenance. • Electronic gluing system (with 2 guns or more) must be applied when making lock-bottom boxes (Optional). • Left and right outward folding belts speed can be micro adjusted to increase folding accuracy. • Extended the middle and upper carrier to stable the delivery for wide boxes. • High speed electronic kicker counting system for easy production. • Upper and lower belts can be telescopically adjusted for easy production run. • All the adjustment of heavy duty double frame trombone section can be made by hand wheel or handle, no additional tool is needed. • In-line kicker, which needs to be applied in line with quality inspection system (Optional). 1. 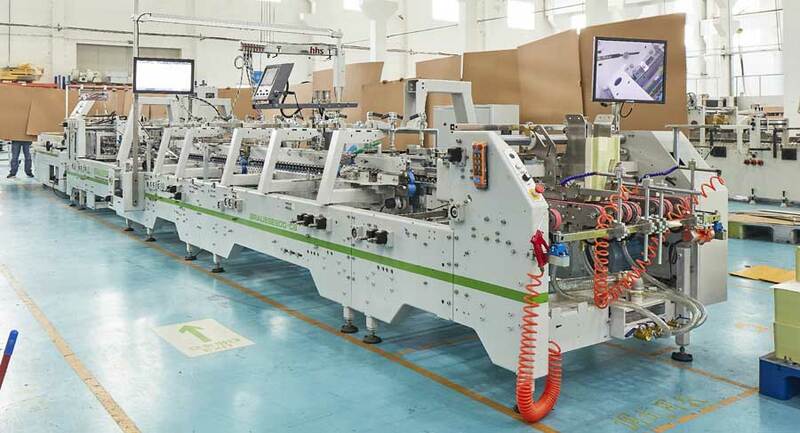 Auto – set a box single spacing, compressing belt speed is synchronized with the machine speed by ratio. It moves only when sensor detects the box coming. 2. Manual – compressing belt keeps moving at a constant speed, regardless of main machine speed. • Additional sponge belt for extra compression of lower area. 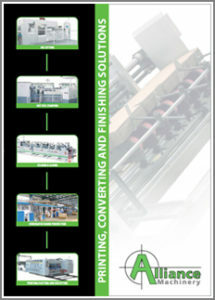 • Pneumatic pressing system for easy adjustment to increase the gluing effect. • Either auxiliary conveyor or J-Packer can be applied to improve delivery efficiency (Optional). • One pinwrench adjustment operation for most accessories, operator friendliness. • Upper belt width 25mm, lower belt width 25mm. • Position indicator throughout the machine. • High speed electronic kicker counting system. • Air-cylinder controlled pneumatic pressing system on conveyor section. • Touch screen for control panel. Bobst Group announces that it will exercise before the end of the year its option to purchase from Gary Tseng the remaining 35% of the Gordon Ltd shares, the Hong Kong based holding company of Shanghai Eternal Machinery Co. Ltd.
Gary Tseng will remain Managing Director in charge of the operations as before. Both partieshave agreed not to disclose any information concerning the conditions of the transaction.